mirka & charlie had a visit from their cousin billy and didn't mirka love having little billy follow her around. 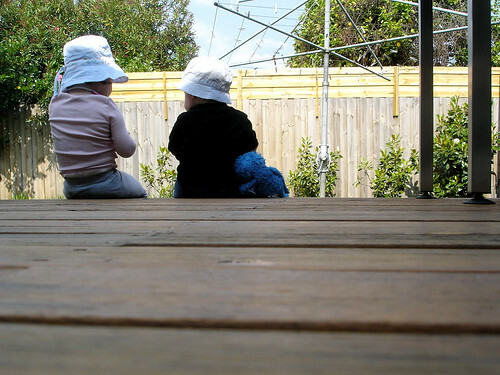 here is a moment between the two of them sharing lunch on the back deck. so cute in their sunhats. like 2 old men gossiping on a park bench in an italian piazza. or like tradies demolishing a couple of pies on a constuction site. even grover got in on the act. smile. What a fantastic picture ... it's so nice to have cousins to grow up with! What a gorgeous photo. We had our little cousins visiting last week. It was pretty fun!